During the program’s pilot year in 2015, high school teachers across the country enlisted their students to interview a grandparent or elder over the Thanksgiving holiday weekend, and record their story with the free StoryCorps mobile app. The result - over 100,000 people from all 50 states participated and uploaded their stories into the StoryCorps Archive at the American Folklife Center in the Library of Congress. They will become an invaluable resource for historians and future generations to come. Why did you start StoryCorps? When I was doing [public radio] documentaries in housing developments, prisons, or homeless shelters, when I turned on the tape recorder and asked people questions about their lives that they’d never been asked, I saw it could be a very important moment. In some cases, it was almost transformative—you could literally see people’s backs straighten when you asked them what they cared about, what their dreams were, and how they wanted to be remembered. So I had a crazy idea: to turn documentary work on its head, so the purpose isn’t doing interviews for educational or artistic purposes, to be seen by, heard by, or read by many people. The purpose could be the interviews themselves. It’s all about giving people the chance to be listened to. And in the course of that, be reminded how much their lives matter. Listening is a great way of showing gratitude to someone, and telling them how much you love them. I hear from people all the time about how the 40 minutes they spent in the StoryCorps booth was among the most meaningful moments in their lives. StoryCorps is creating a formal structure for that conversation to happen, and archiving it at the Library of Congress so people know that interview will live on for generations—and know that their story is important enough to be part of American history. How did The Great Thanksgiving Listen come to be? Why Thanksgiving? StoryCorps’ signature interviews happened in booths across the country, where two people record with the help of a facilitator. A few months ago we created an app where your mobile phone becomes essentially a digital facilitator and you can do StoryCorps interviews at any time, any place, and upload them to the Library of Congress. This is the first opportunity for us to scale it and the response has been far beyond my expectations. We’ve had around 12,000 stories come in through the app, more than twice what we typically record in a year. The Great Thanksgiving Listen is the first big project with the app. We are asking U.S. History and Social Studies teachers across the country to ask their students to record a grandparent or another elder over Thanksgiving weekend. It’s a crazy idea—to honor a whole generation of Americans over a single weekend and create the largest collection of human voices ever gathered in three days. I think we can do it. Thanksgiving is a time when families are around. It’s a time of generosity and gratitude. StoryCorps is a project about generosity and love. These interviews can happen any time, but we wanted to create a moment and day to inspire people to do this. Why did you choose Facing History to be the first partner for The Great Thanksgiving Listen? There was no question when I drew up the list of the initial partners that I wanted Facing History on board. I’ve followed Facing History from afar with enormous admiration for a decade. People always bring up Facing History to us, and I’ve always felt like Facing History and StoryCorps are remarkably spiritually aligned and share all the same values. Facing History’s reach is deep and your teachers are phenomenal. What you care about is what we care about. [The Great Thanksgiving Listen] will help us remember what’s core to Facing History: that there is so much more that we share in common than divides us. If we spent more time listening to each other and less time screaming at each other, what a better and stronger country we would be. How are interviews different when students interview their elders? Typical StoryCorps stories have been individuals in their 30s and 40s interviewing someone in their 60s or 70s. The Internet is such a coarsening place, and when we launched the app, I was concerned about people misusing it. I’ve been amazed people are treating the app with enormous respect. We are seeing a younger audience able to use the app exactly as it is intended. In an interview I heard just yesterday driving to the grocery store—it had just been uploaded by the participants using the app—two kids who were dating were talking about their relationship. It was so intimate, honest, and gorgeous. One of the kids had been diagnosed with MS and it was remarkable to hear how seriously these young people were treating this opportunity, being given the license to talk about things they don’t normally get to talk about, and to connect with someone who matters to them in a very profound way. Preserve oral history with us this year by recording your own interview! Teachers can check out this year’s new and improved 2016 TGTL Teacher Toolkit as well as other resources to help plan for their classrooms by visiting thegreatlisten.org. Don’t forget to tag your interview with the keyword FacingHistoryandOurselves! This interview was originally posted on Facing Today on October 7, 2015. 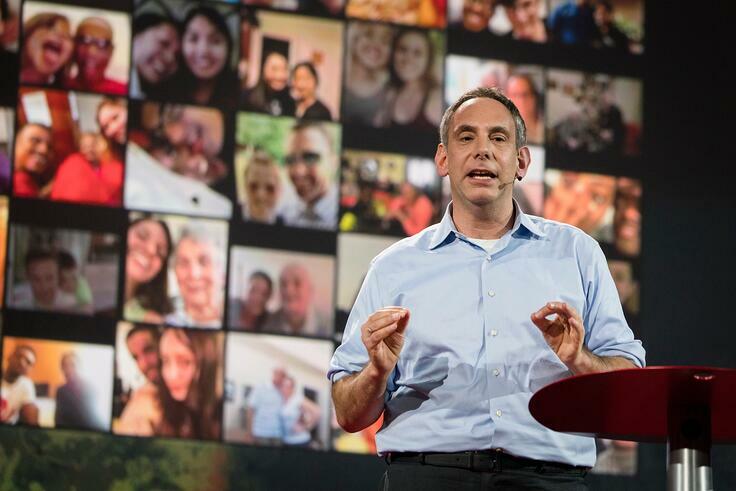 Photo Credit: Dave Isay, Founder of StoryCorps. Photo Courtesy of StoryCorps. Aileen is Facing History's Marketing & Social Media Specialist.